precedentedly horrifying and stunning spectacle, charged with political meaning. Eisenstein's idea of staging a massacre on the Odessa Steps was truly inspired. While being caught in the line of fire is bad enough, the stuff of nightmares, the last place one would want to be if this were actually to happen would be on a lengthy flight of stairs. Steps are always a precarious place to be under any circumstances, because they threaten us with loss of balance. Much of the action at the beginning of the Odessa Steps sequence involves images of people losing their balance, tripping, and falling as they desperately try to flee the gunfire. Eisenstein even strapped a camera to an acrobat and had him do a flip to obtain topsyturvy footage that approximated the point of view of someone falling headfirst downstairs. Eisenstein intensifies the spectator's horror (and fascination) at witnessing this spectacle by focusing on the very people who would have the most difficulty escaping from danger on stairs. Thus the first person we see fleeing is a man without legs. We watch him desperately thrusting himself down the stairs supported only by his arms. Soon after, a one-legged man on crutches appears, who negotiates the steps with even more difficulty than the legless man. In quick succession, interspersed with long shots of the crowds of people fleeing en masse, we see a woman with a sick child, a group of elderly men and women, and, toward the end of the sequence, and most pathetically of all, a young mother who has somehow found herself stranded on the steps with an infant in an unwieldy baby carriage. She is horribly caught between the murderous soldiers above and the endless flight of steps below. Eisenstein compels us to watch in shock and fascination as terrible fates befall the citizens of Odessa. The sick child is shot by the soldiers and falls, his body splayed on the steps. His mother, in her own state of panic, at first does not notice and keeps running. Suddenly aware that her son has fallen behind, she starts back up the stairs to find him. She watches in agony as fleeing citizens trample his body. She picks up the body of her desperately hurt child, but, instead of fleeing, she continues her ascent up the stairs, to confront the soldiers with what they have done. After a suspenseful build-up, as the mother approaches closer and closer to the soldiers, appealing to them not to shoot because her child is ill, mother and child are brutally shot down, as are a group of elderly citizens who have followed the mother up the stairs to join in her appeal to the soldiers. The young mother trapped on the huge flight of stairs with the baby carriage is shot in the stomach. In an almost unbearable irony the mother unwittingly becomes the cause of her infant's demise. Her body, as it falls, pushes the carriage with her infant off the landing sending the helpless baby rolling down the huge flight of steps to certain death. At the bottom of the steps murderous Cossacks on horseback armed with swords cut off the escape routes of those who have survived to reach the bottom. A woman wearing a pince-nez is shot in the right eye. Blood spurts from underneath the shattered lens. Images such as these are a far cry from Eisenstein's comedic circus attractions, but they serve the same function—to keep the spectator's eyes cemented to the screen. This mise-en-scène of horror leaves an even stronger impression on our psyches and nervous systems because of the way Eisenstein breaks down the action of the massacre into separate shots and joins them together using innovative methods of montage. Eisenstein, as we have seen, owed much to Griffith's contributions to the development of film as a narrative art, but he both developed Griffith's ideas further and broke Griffith's rules to obtain startlingly new cinematic effects. The Soviet filmmakers learned from their close study of Griffith's methods that if a film narrative was to be dramatically effective it had to free itself from the model of filming a dramatic action from a fixed distance as if the camera were a spectator watching the action in a theater. As I remarked earlier, by fragmenting the proscenium space that early cinema had left whole, Griffith gave varying dramatic emphasis to the action as the story demanded. In the sequence we analyzed from The Birth of a Nation, for example, Griffith breaks down the action of Flora filling the bucket with spring water into three separate shots, emphasizing, through the use of an inserted close-up, the action of her dipping the bucket into the spring. The close-up gives the moviegoer a privileged intimacy with the action in a manner that would be impossible for the spectator in the theater. In the same sequence, Griffith reconnected the discontinuous shots by matching Flora's movement from shot to shot. Match cutting was important to Griffith because he wanted the viewer to remain mentally immersed in the dramatic action, in a state of mind that would be disrupted if the viewer were to become aware of the medium through jerky or mismatched shots. Later theorists refer to deliberately mismatched shots as "jump cuts." By matching the movements of Flora in long shot with her movements in close-up as she fills the bucket, Griffith gives the film audience a closer, more dramatically satisfying view of the action while still maintaining the illusion that we are watching an unmediated reality in a coherent screen space. Griffith's goal was to offer the moviegoer an experience similar to that of watch ing realistic theater, with the advantage of having an even better view of the action. Eisenstein's belief that films should be constructed through a series of shocks or conflicts, he claimed, was inspired by Hegel's concept of dialectics, on which Marx's theories of revolution were based.11 The dialectical method, according to Hegel, is the principle behind change, a universal law of thesis, antithesis, and synthesis, of contradiction and reconciliation, that governed all matter and history. The Bolshevik revolution itself was seen as a clash of dialectical opposites, between the workers and the property-owning establishment, resulting in the synthesis of the new workers' state. Eisenstein felt that a work of art would have more power if it was structured according to these same dialectical principles, involving a continual clash of opposites. Hence, he imbued his films with conflict, starting at the most fundamental graphic level. Eisenstein created optical conflicts by juxtaposing shots whose graphic elements visually contrasted. For example, he followed an extreme long shot of the citizens of Odessa running down the stairs (figure 5) with an extreme close-up of the legs of a man on the verge of falling (figure 6). Griffith deliberately avoided such a practice, cutting gradually from long shot to medium shot to close-up, fearing that abrupt changes in the size of the image would unsettle the viewer and call attention to the film's editing, disturbing the spectator's immersion in the story. Eisenstein, who was striving to move his audiences without letting them relax into illu sion, was indifferent to such considerations. 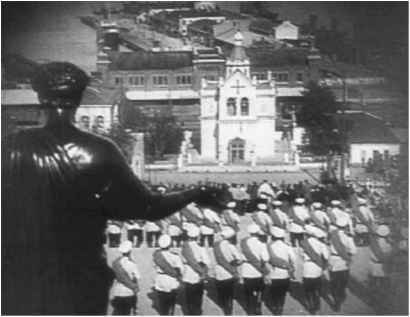 Eisenstein created visual conflicts in numerous other ways: He edited pieces of film so that the directional movements within juxtaposed shots clashed. That is, a shot of a crowd running in the direction of screen left would clash in the next shot with an image of the crowd running in the direction of screen right. A shot lit somberly would be juxtaposed with a shot lit brightly. An image of organized, purposeful movement would contrast in the next shot with an image of irregular, chaotic movement. (See figures 7 and 8.) A shot compositionally designed to emphasize vertical vectors or lines would be juxtaposed with a shot organized horizontally. Diagonal lines tending toward the left would clash in the next shot with diagonal lines tending right. In the first place, noticing the frenzied condition of the people and masses that are portrayed, let us go on to find what we are looking for in structural and compositional indications. Let us concentrate on the line of movement. There is, before all else, a chaotic close-up rush of figures. And then, as chaotic, a rush of figures in long-shot. Then the chaos of movement changes to a design: the rhythmic descending feet of the soldiers. In this acceleration of downward rushing movement there is a suddenly upsetting opposite movement—upward: the break-neck movement of the mass downward leaps over into a slowly solemn movement upward of the mother's lone figure, carrying her dead son. And then suddenly: A lone figure. Slow solemnity. Upward. But—this is only for an instant. Once more we experience a returning leap to the downward movement. The clashing movements and rhythms of the montage pieces keep the spectator disturbed and off balance, just like a fleeing citizen of Odessa. when the sick child is shot by the soldiers. His fallen body is positioned in such a way that it lies perpendicular to the line of the steps, the line of the boy's body creating a graphic conflict with the line of the steps. (See figure 9.) While Griffith composed his shots primarily according to the meaning each shot conveyed through the action within the shot, Eisenstein believed that emotional effects derived not just from the content of the shot but also from the way the shot was graphically composed. Eisenstein's insistence on the importance of exposing the viewer to a constant barrage of graphic conflicts and visual shocks, and his disdain for the rules of smooth editing continuities established by Griffith, enabled him to achieve striking narrative effects. At the beginning of the Odessa Steps massacre we see a young woman with dark bobbed hair react to what we later realize is her first sight of the soldiers marching in rank and firing on the crowd. Here, Eisenstein does not express the woman's shocked reaction simply by photographing her facial expression and gestures, as Griffith would have done. Rather he presents the woman's reaction in a series of four close-ups, jerkily edited together through obviously mismatched jump cuts, each lasting a fraction of a second. Thus, the woman's shock is suggested not primarily through the expression on her face, but through the jolts created by the unconventional jump cuts. The shots of the woman are all the more disconcerting because Eisenstein has broken another rule of standard film continuity: He has reversed the order of cause and effect. Rather than showing us shots of the soldiers firing and then the woman reacting, Eisenstein shows us the terrified reaction before he reveals the cause. There is something particularly unsettling when we see someone react in horror before we know what the source of the horror is. It sends our imaginations into high gear as we try to fathom the reason for the reaction. We do not see the cause of the woman's panic for two more shots, both of which focus on another terrible image: the legless man in desperate flight down the steps. The mechanized line of armed soldiers, when they do appear, are even more terrible because the woman's and man's horrified reactions to the soldiers spill over onto our perception of their image. Eisenstein, influenced by the experiments in Kuleshov's workshop, was acutely aware of how viewers' mental processes can heighten the emotional power of film. 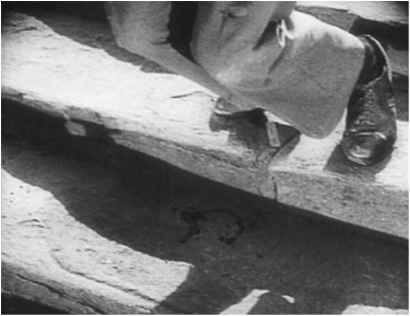 The power of the Odessa Steps sequence is further heightened because Eisenstein's editing technique deliberately disorients the spectator in screen space, departing from the methods Griffith developed to provide viewers with a clear, coherent spatial orientation. In Griffith's representation of Civil War battle scenes in The Birth of a Nation, for example, Griffith begins his sequences with establishing shots, extreme long shots of the battles which provide the spectators with a panoramic view of the entire scene. Thus, when Griffith cut to closer shots of the action for dramatic emphasis, the viewer had a clear mental picture of offscreen space. Though the battle scene shots are filled with chaotic action, the viewer's orientation in screen space is kept intact. The soldiers from the South are always on screen left, while the soldiers from the North are always on screen right. This kind of careful attention to the viewer's orientation in screen space is entirely lacking in the Odessa Steps sequence. In the first place, we are never given an establishing shot of the Odessa Steps in their entirety. Mostly we experience the steps in fragmented pieces: shots of masses of people rushing down the steps interspersed with close shots of individuals and shots of the faceless soldiers relentlessly advancing and firing their guns. We are never given a clear sense of where anyone is in relation to anyone else. stein adds greatly to the affective power of the scene. The lack of spatial orientation on the Odessa Steps works because it compels spectators to experience something of the same mental confusion and loss of bearings that the people on the steps suffer. The quick pace of the editing, which jerks the spectator's attention from place to place, likewise mirrors the wild way one's attention would jump from one perception to another when one is in a state of anxiety or panic. 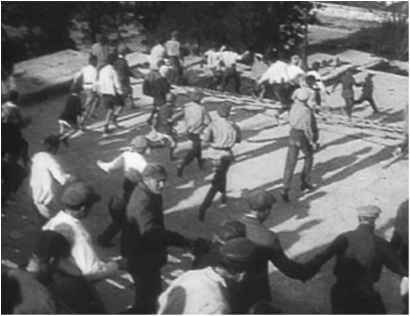 In this way, through his editing technique, Eisenstein transfers the panic of the people on the steps to the spectator. Eisenstein takes as many liberties with his presentation of time as he does with his presentation of space in the Odessa Steps sequence, again creating powerful effects. In an actual count, the Odessa Steps number 120 steps, and, one might estimate that if people were being fired at, they would vacate the steps in well under a minute of actual time. Eisenstein extends the time to over five excruciating minutes. The primary way he extends time is through the repetition of some of the same shots. When one closely observes the sequence, one notices that some of the shots of the people fleeing en masse, as well as shots of the soldiers firing, are in fact repeats of the same shots. Because we are not given an establishing shot of the Odessa Steps and have no idea of their extent, Eisenstein can draw out the duration of the action as long as he wishes through shot repetition and continual crosscutting. 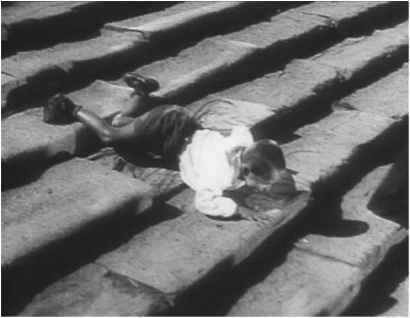 In any case, Eisenstein was not striving to give us a literal, realistic picture of the massacre on the steps. Through his innovative, time-expanding film technique, he conveys the subjective reality of what it would feel like to be trapped in a traumatic situation that seemingly goes on forever. In the Odessa Steps sequence Eisenstein creates the time-space continuum of a nightmare from which there is no waking. The horror on the Odessa Steps culminates when the mother with the infant in the baby carriage is shot. Here Eisenstein plays simultaneously on two primal fears: the fear of an infant being abandoned by a mother and the fear of a mother who realizes she is helpless to protect her infant. Eisenstein drastically expands the screen time given to this moment to etch it forever in our memories. He draws out the mother's agony by devoting 10 shots to her slow and painful death, as her body takes an unnaturally extended time to fall to the ground. These shots do not happen in quick jump cuts which flash before our eyes, but in shots of agonizingly long duration, some of which last up to seven or eight seconds, forcing us to ponder and dwell on the mother's suffering, which is also emphasized by extreme close-up shots of her face and hands. Eisenstein further extends the duration of the mother's death by cutting away from shots of her as she dies to other actions. He cuts to mounted Cossacks at the bottom of the steps slashing out at the fleeing populace, to images of the soldiers continuing their deadly march down the steps, to long shots of masses of citizens fleeing the troops. Four times Eisenstein cuts to the wheels of the baby carriage teetering on the edge of the steps to prolong the suspense of whether or not it will be pushed over the edge by the body of the dying mother. What was Eisenstein’s belief about shots and sequences? Why was the odessa step scene an important moment in film history? What happens in the Odessa step sequence? What is in eisensteins odessa steps sequence? What is odessa steps in battleship? What is odessa steps scene using the montage theovey? What rolled down the Odessa steps in thew film? Did people leave the theater after odessa steps? 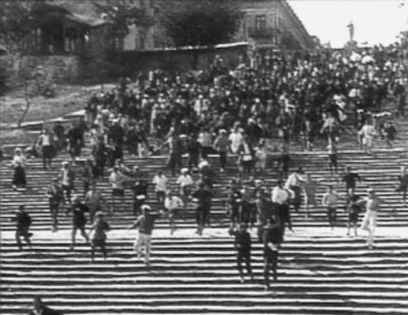 What is discontinuity editing how is it used in the odessa steps sequence in battleship potemkin? What does the red flag mean in battleship potemkin? What was your reaction after viewing the “odessa steps” sequence? 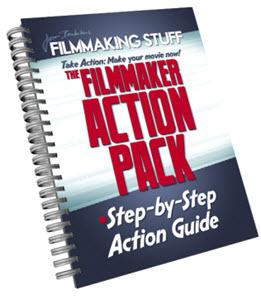 What is discontinuity editing How is it used in the ODESSA STEPS sequence in BATTLESHIP POTEMKIM? How long did the odessa steps scene last?